Germfree manufactures units that feature: complete stainless steel construction, chemical resistant coatings, laminar flow filtration, as well as Class I, Division 1 explosion-proof systems. 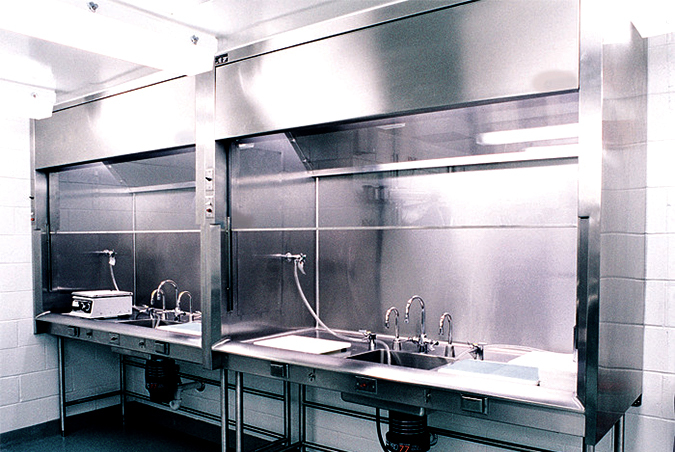 These laboratory fume hoods are universally used for the safe handling of chemical fumes. Because of Germfree’s stainless steel fabrication expertise and intimate knowledge of airflow dynamics, custom-designed stainless steel fume hoods are available to meet your specific needs. Germfree’s custom stainless steel fume hoods are all-welded type 316L stainless steel with radiused bends. They are ideal for use in cleanrooms, pathology suites, food processing areas or any environment in which frequent wash downs are required and a non-shedding, corrosive-resistant material is needed. For increased chemical resistance the stainless steel can be Halar® coated. All Germfree fume hoods can be built as explosion-proof units. We manufacture explosion-proof fume hoods up to Class I, Division 1 for applications “where ignitable concentrations of flammable gases, vapors or liquids may be present” (ANSI/NFPA, NEC). Air filtration systems are available in a wide range of types, sizes and configurations. Equipment selection is based upon the degree of particle or gas removal required, quantity and characteristics of the contaminants within the space as well as the intended applications. Germfree has developed a High Containment Filtration System for hazardous materials where fail-safe redundant exhaust air filtration is necessary. These systems provide the proper filters and airflow required to remove hazardous materials.